Mike, Orion the Hunter is always behind the sun as seen from Earth in June. It comes back to the predawn sky every year in late July. By early September, Orion is rising in the wee hours and is well up in the southeast an hour before dawn, as shown on today’s chart. Orion will soon be up by midnight, then 10 p.m. . . . and by December, you will find it rising in early evening. Bright star in east in the evening? Might be planet Jupiter, nearly at its closest since 1951. There is nothing unusual about Orion’s shift from the predawn to the evening sky. This constellation is simply following the westward shift of all the stars, caused by Earth’s orbit around the sun. 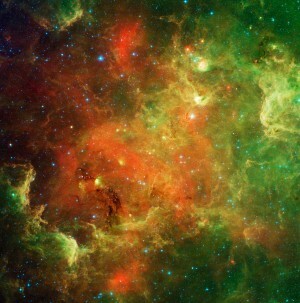 As we orbit the sun, our night sky points out on an ever-changing panorama of the Milky Way galaxy. Our orbit causes all the stars to rise approximately 4 minutes earlier each day. 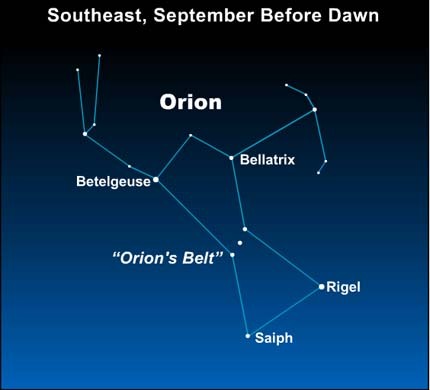 If you are an early riser, look to the southeast and spot the Orion the Hunter roaming the September predawn sky.